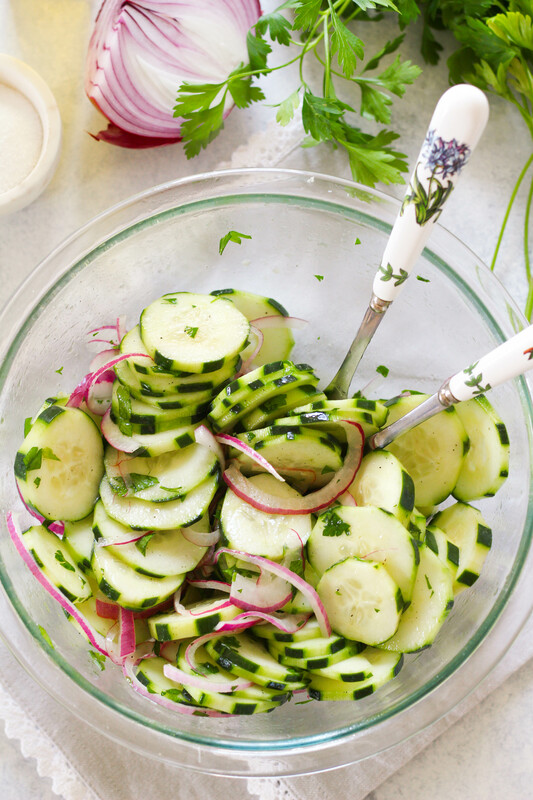 Crunchy and refreshing, this German Cucumber Salad is sure to hit the spot any time of year. 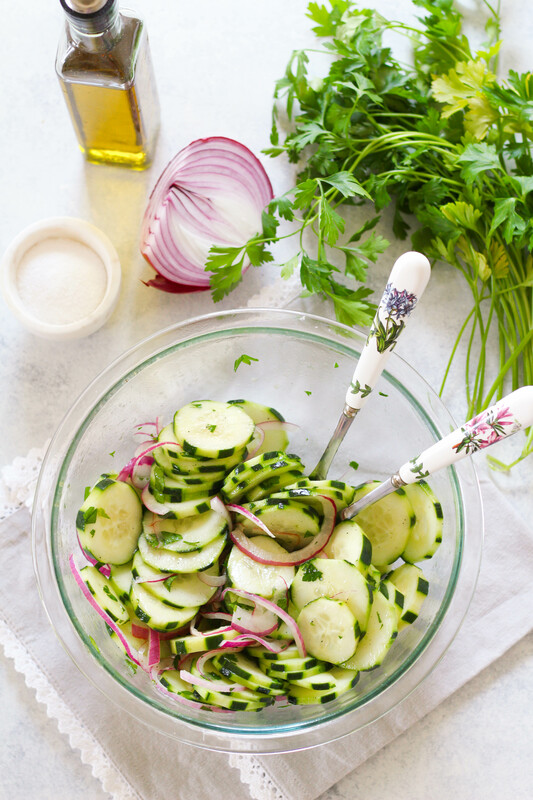 Serve German cucumber salad alongside grilled meats or your favorite German dish! This is my Oma’s recipe. My Oma is my German grandmother on my Dad’s side. She is straight from Germany– she grew up there, and even met my Opa while he was overseas (he was in the military, stationed in Germany!). She is one of the nicest people I know and cares very much for her children and grandchildren. Not only is she nice, but she is a badass. Oma is in her 80’s and she power walks almost 5 miles every morning, at 5am. I’ve tried to keep up with her before and it’s impossible. Oma is also a fantastic cook. Whenever we go visit, Oma makes the usual: breaded pork schnitzel, potato salad, deviled eggs, homemade pickles (with cucumbers from her garden), pineapple cake, and this cucumber salad. It’s like the ultimate comfort-food grandparents-house childhood-favorite meal. If you invite Oma and Opa over for the holidays, she is guaranteed to bring this dish. 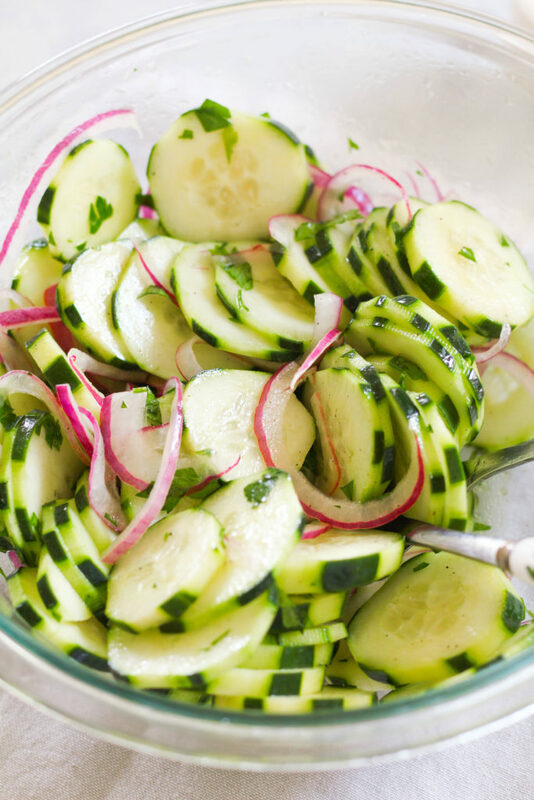 Her version is made with thinly sliced cucumbers, chopped red onion, vinegar, and LOTS of salt. When my family came over for dinner the other night, I decided to remake her recipe using a little less salt. It’s refreshing, flavorful, and works great as a side item for any meal! I like to add the dressing and let it sit in the fridge for a couple hours before serving– this slightly pickles and softens the vegetables. It’s even better the next day! Wash, dry, peel and slice the cucumber. Peel and slice the red onion. Place into a large bowl. In a small bowl, whisk together the olive oil, vinegar, salt, pepper and sugar. Taste the dressing-- add more salt/sugar according to taste. Mix the cucumber and onions with the dressing. Top with chopped parsley! My family is obsessed with my grandmas German cucumber salad too! This looks like such a simple but delicious recipe. I just got a spiralizer and have a bunch of cukes to use up, so looks like I’ll be trying this soon! Boy, does this salad bring back memories. 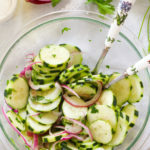 My mom and dad always made cucumber salads similar to this as soon as the first cukes were big enough to pull from the vine until frost came. I love the idea of using a spiralizer to make the salad, and Mom never made hers with red onion or parsley, so this is going to be a special treat. So pretty. In fact, I like this recipe so much that it is today’s Recipe of the Day on a Facebook page I curate called Cooking with Whole Grains & Real, Whole Foods. This salad brings back a ton of memories for me as well :) Always reminds me of my Oma! Thanks for sharing my recipe!